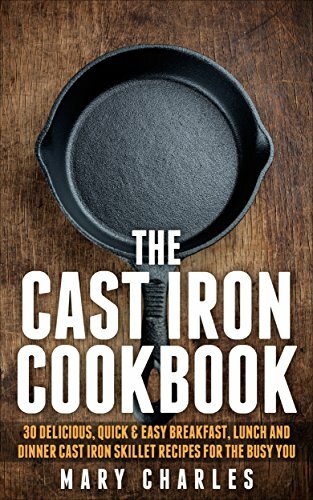 [PDF] The Cast Iron Cookbook: 30 Delicious, Quick & Easy Breakfast, Lunch and Dinner Cast Iron Skillet Recipes For the busy you | Free eBooks Download - EBOOKEE! Description: 30 Delicious, Quick & Easy Breakfast, Lunch and Dinner Cast Iron Skillet Recipes For the busy you Experienced chefs refer to cast iron skillet as precision cooking utensil, as it enables accurate control over cooking temperatures. This collection of simple, delicious and healthy recipes will show you just how much you can do with just one cast iron skillet. The recipes in this book are carefully designed to help you make really delicious quick and easy, fat-free cast iron meals on the go. This is a great book for beginners. All 30 recipes have been specifically designed for cooking in a cast iron skillet, your friends and family will love them all. Despite all the technological advancements that have come along in kitchenware, the cast iron pan remains a classic. If you love to prepare healthy quick & Easy meals from your skillet, then this book is just for you. 2017-12-14[PDF] Everyday Ginger Recipes: 30 Easy and Natural Recipes For Breakfast, Lunch and Dinner. No comments for "[PDF] The Cast Iron Cookbook: 30 Delicious, Quick & Easy Breakfast, Lunch and Dinner Cast Iron Skillet Recipes For the busy you".